In reviewing last year’s list, I still need to finish a couple of books. I am almost done with Committed and am thoroughly enjoying Gilbert’s views and history of marriage. I started reading Cutting for Stone earlier in the year, but I decided it was a better summer read since I can only read a few minutes each night before crashing. This novel’s language is rich and the story engaging, so it requires a little more focus than others I might read. My grandmother recently gave me a big stack of novels to read. I’m starting with The Whistling Season and Out Stealing Horses. Are you on GoodReads? Find me there. …they become work-place bullies. I have read several articles recently about bullying in schools amongst kids. But, in looking around the different venues in my life, I see that bullying doesn’t end at high school graduation. I usually agree with Seth Godin, but today’s post hit me funny. Godin concludes the post by writing, “Being a bully is a choice, and falling for this cycle, permitting it to continue, is a mistake.” I agree that being a bully isn’t only a choice, it’s a habit. What hit me more strongly was the last word–mistake. In talking about the post with my colleagues at our bloggers café, it may be that his wording is throwing me off, but I read “mistake” as something the victim is choosing to ignore thereby making the “mistake.” I explained that suffering due to the words and actions of a bully is a form of abuse not a mistake. Bullies create and thrive on the fear they instill in their victims. In these tough economic times, the people I know who are bullied on a daily basis have no out available to them. There is not another job for them and yes, they’re looking. Go to HR and file a complaint? Sure, but then there’s the retaliation, including being fired, to add to the stress. What about the members of the tribe, to use Godin’s term, that witness the bullying? What resources are available to us to intervene effectively? What are the repercussions for the victim? While we didn’t come up with any solutions, we started a vital conversation. If nothing else, we may be more self-aware our own dealings with our co-workers. I am a lousy storyteller. I tend to get to the middle of a story and forget where I am going. I was keenly aware of this when I lived with a Mexican family in Monterrey and attempted to tell elaborate stories in Spanish. What was difficult in my native tongue was 100 times more so in my second language. I have been passively following the ds106 assignments and hash tags for the past couple of weeks in my efforts to better my storytelling skills. After reading Dean Shareski’s post tonight, I decided to try this one where you create a story from song titles and even sign it with a song title. 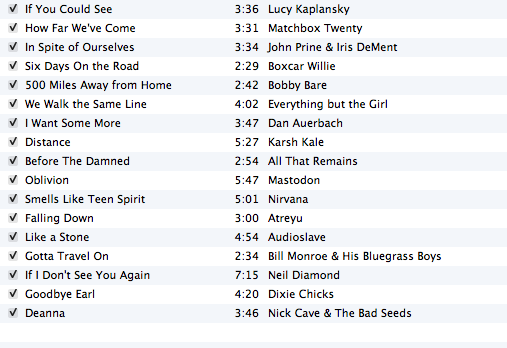 I scanned through my music in iTunes and dumped the songs that I thought would fit into a story into a playlist. Then I culled through that playlist, saw that I had a theme going and pulled the story below together. I invite you to try it yourself! In an effort to motivate me to practice the piano, my mom would preach, “Practice makes perfect!” Perfection was never my goal. My goal was to survive each recital without forgetting the notes. The pressure of memorizing pieces for those recitals was painful. My piano teacher would say things like “Stinky poo!” or “<Insert composer’s name here> is rolling over in his grave right now!” It’s really no wonder that I wanted to quit my lessons weekly. I only forgot the notes once when I had to make up the ending to a song. I’m sure that composer shuddered a bit in his grave that night. My sister-in-law’s mom tends to say, “Practice makes practice.” My brother and I just look at each other and shrug because neither of us understands that one. It makes me think of those biblical passages with all the begats: Abraham begat Isaac who begat Jacob who begat Joseph and so on. Who wants to practice only to practice more only to practice even more? I’m sure this points to my tendency to want to finish something in order to move on to the next great thing. So, what matters more? The process or the product? The journey or the destination? I keep coming back to that phrase and was asked it in an interview last summer. 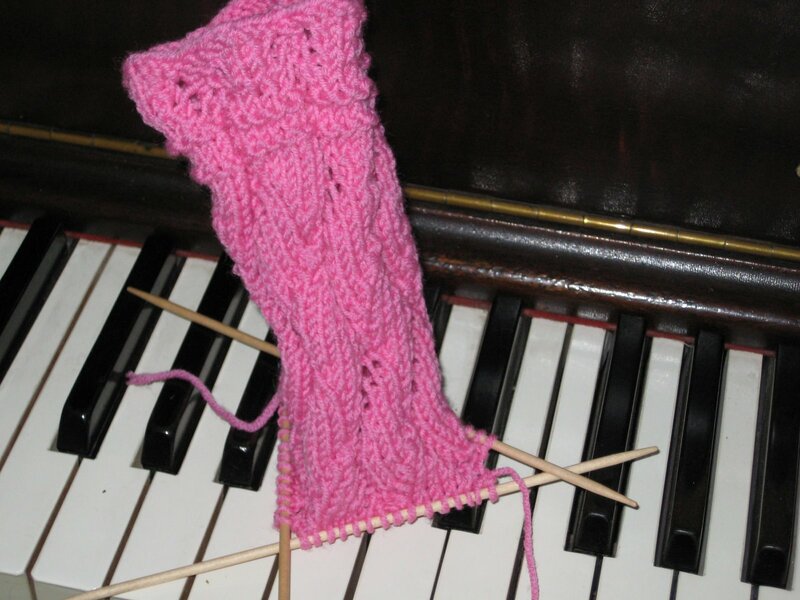 I love the product, whether it’s the recital, the presentation or the finished knit good, but I struggle with enjoying the process–the tedious lessons, the countless edits, the frogging (rip it rip it) of the knitting. My personal growth plan for 2011 includes embracing the process and starting to enjoy the journey. I cannot believe how fast this year flew by. I’m looking forward to summer to catch up on both my fun and professional reading lists. I love reading fiction so much that I really have to force myself to read non-fiction. I try to read one work of fiction whilst trudging through two of non-fiction. I think the more accurate ratio is 6:1, though. My first goal is to finish reading Crucial Conversations. Several people in my admin cohort recommended it. One friend even gave it to everyone in her family for Christmas one year because she found it so helpful. My Twitter pal Anna (@alove) got me hooked on The Spellman Files, so books 3 and 4 are atop this list. Elizabeth Gilbert’s Eat, Pray, Love rocked my world when I read it in 2007. I bought Committed recently and plan to read it while I wait at appointments. I am super geeked up about the final installment in The Hunger Games series titled Mockingjay, but have to wait until the end of summer for its release. (Another @alove rec.) I have found myself reading young adult fiction more and more and really enjoying it. I read Steve Kluger’s My Most Excellent Year over spring break and recommend it to my students (and anyone else, for that matter) for their summer reading list. A student recommended The Perks of Being a Wallflower and my 11-year-old niece recommended highly The View From Saturday, so I’ll be looking for those soon. Daniel Pink’s Drive and Seth Godin’s Linchpin are both in my queue under the non-fiction regimen. Little Bee and The History of Love are both on my nightstand waiting for summer to be read. I had an interesting conversation with a K-5 Spanish teacher in a mountain school district about testing and data collection. I know that data-driven instruction and decision making are the rage these days and have openly wondered about its impact on kids. After the conversation today, I question it even more. In our school this year students test three times before CSAPs are administered. The tests they take predict their CSAP scores. I have a feeling that students are going to feel “tested out” and may not perform well on the state test. My friend said that she overhears students talking about their own test levels: “I’m at level H. Are you still at level F?” Students are stressed over their levels, teachers are frantic about their students’ levels (i.e. data) and it is even seeping into the community. Over Christmas one teacher advised a parent to work on their child’s timed reading. My friend overhears teachers shouting, “You have two more minutes to get everything out and on paper!” When in life are we timed how fast we read? It is taking me a month to get through My Life in France. What is the penalty if I don’t finish fast enough? Where is the love of learning? What are we fostering in our kids? Hurry! Race! Compete with each other to get to the highest level (the top?) as fast you can! Go! Go! Go! One of my favorite professors used to deride The Little Engine that Could citing that it fosters workaholism. I wonder what she would make of the data push going on today. Last month I spent two days at a neighboring elementary school to meet a requirement of my internship. The first day I shadowed the principal. I arrived just in time for lunch duty. I donned my apron, washed my hands and took my place in the cafeteria. In short order I fell in love with several darling second graders. Their energy was frenetic and contagious. They needed help opening tough lids, asked to go get catsup or a napkin, and even wanted to touch my shiny blue shoes. Later that afternoon I wrote a letter to parents notifying them in writing of their kid’s suspension. Who knew elementary kids got suspended? The following week I was principal-for-the-day at the same school while their principal was at a conference. That day at the elementary school contrasted sharply with my usual gig at the high school where my morning had started with kids, drugs and suspensions. At the elementary school I had a couple of fires to put out, drama to confront and one 3-part mystery to solve. I took a complaint from one girl who was being teased in PE class. She had a special arrangement with the teacher to run less than the other kids due to health reasons. The boy called her a “cheater” because she finished the run first. Mind you, there was no prize or trophy for coming in first. But, given our competitive nature, he felt wronged and she had her feelings hurt. The mystery surrounded $20, a phantom hand-held device and a waterproof flashlight. I interviewed the three kids in question and straightened out the confusion. I taught one kid that he needed to see the goods before forking over his cash. Life lessons 101. I love high schoolers and their host of problems and drama. I love to watch them grow from insecure 14-year-old kids to sure 18-year-old young adults. While I had a blast at the elementary school, I’m not sure I’m willing to trade the big kids for the younger ones…yet. Over the past few years I have implemented project-based assessments in every level of Spanish that I teach. I think that I have come up with some great ideas, but after reading Apple’s Challenge Based Learning white paper and working through three days of IB MYP training I need to work on being more systematic in presenting the project. To use a colleague’s words, I need to unpack the assignment before I hand it to my students. When I have laid out the steps for my students, they have been more confident in their approach and successful in producing their final product. Over the past week I have been revising old project-based assessments that my colleagues and I will assign this year. I prefer these types assessments to traditional exams for a number of reasons. One, they are authentic by design. Students may one day have a job where they have to create a multi-media presentation on a given topic. One project that I have planned for September involves students creating a presentation about a Spanish-speaking country. Their presentation can take any form that the students see fit. Their audience is potential study abroad candidates. Students will brainstorm, collaborate, create and share their ideas and projects. Another benefit of project-based assessments is that students have the unique opportunity to take what they know and love, whether it’s music, technology, or art, meld it with what they are acquiring in Spanish class and then produce an authentic product. I love to see kids shine and project-based assessments afford them this chance. Click to read my Don Quixote assignment and hear an amazing project from one of my students from last spring.